Over the past years Ubuntu gain more and more ground in the tech world from servers to desktop usage, recently in hand held technology. Given the popularity of Windows and vendor support there were large number of programs developed that can run on Windows platform which unsupported by *nix system like Ubuntu. Thanks to Alexandre Julliard , a program called Wine was born out of necessity of *nix world, which can run many of the Windows vendor applications. Wine (short for Wine Is Not an Emulator) is a free and open source compatibility layer software application that aims to allow applications designed for Microsoft Windows to run on Unix-like operating systems. Wine also provides a software library, known as Winelib, against which developers can compile Windows applications to help port them to Unix-like systems. Fire up terminal to get started. 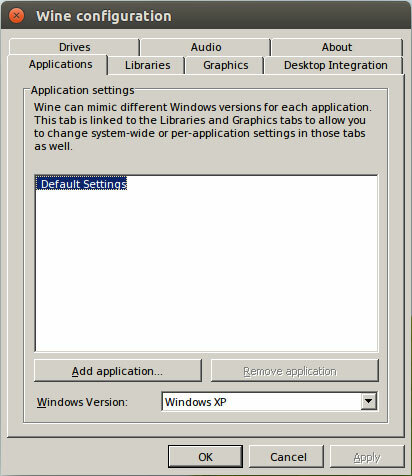 Open up Configure Wine and set to Windows version to Windows XP. Now you can download Windows executable and run it with Wine.